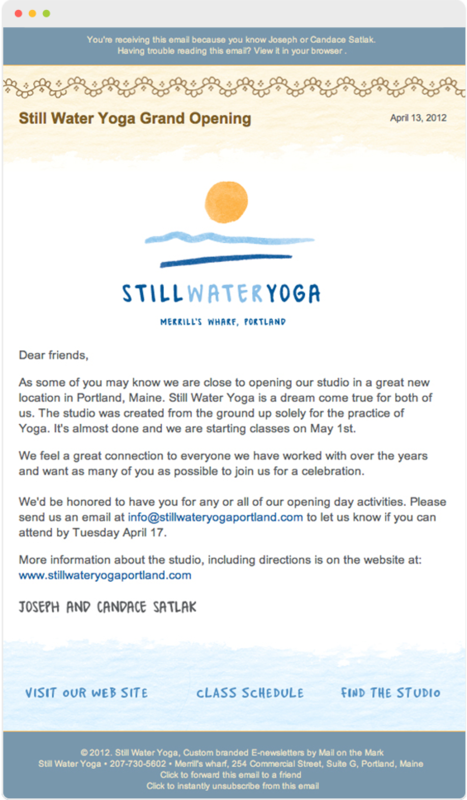 Still Water Yoga is a Portland, Maine based yoga studio specializing in the balance of spirit, mind and body through the Iyengar inspired practice of yoga. The look and feel of the newsletter matches the hand-drawn quality of their brand identity. The newsletter structure is flexible to be as simple or as complex as the client needs it to be. When you’ve developed a distinct brand identity, you don’t want to rely on pre-built templates. Your e-newsletter is an important brand touch point and our professional designers will ensure that it’s as beautiful as every other part of your image. By looking at our detailed reports, you can learn: who is most likely to read your newsletter; when is the best time to send it; and what offers promote the most clicks-thrus.